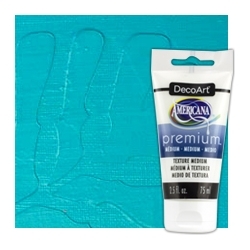 Mix Texture Medium with Americana Premium Acrylics or use it alone to add dimensional texture to your artwork. Made from fine grinds of powder, this medium is perfect for adding more body to acrylic paint. This opaque medium is made from about 50% solids and provides excellent tooth when painting on top of it. Texture Medium is also compatible with all of the other mediums in the line so the possibilities are endless.